Gent - On Saturday we can expect cloudless weather. On Meteo Info you will find current weather data, local weather forecasts and a treasure of useful information around weather. Thanks to our high-resolution weather radar and current severe weather warnings there will be no nasty surprise any more. Belgium has a typically moderate west European climate. Thanks to the mitigating effects of the Gulf Stream, this is characterised by pleasant summers and winters that are not unduly severe. 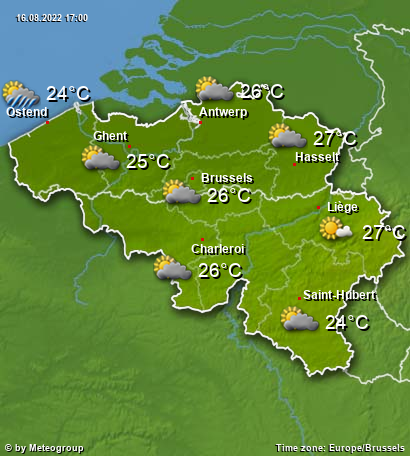 The period from June to August sees the highest temperatures in Belgium, with average daily maximums between 18 and 23 degrees. In the winter months from December to February average temperatures over a number of years come to between -1 and +5 degrees. The coldest and wettest month in Belgium is January. The average temperature for the year in Brussels comes to just short of 10 degrees, with an annual precipitation of around 820 litres per square metre. The climate is significantly influenced by North Sea conditions. These are responsible for a generous supply of atmospheric humidity, associated with frequent precipitation. In the long-term average, it rains every other day. Atlantic pressure troughs pass over Belgium at regular intervals, so that stormy conditions on the coast and in the west are not uncommon. With every kilometre further inland, the wind strength and humidity level decline. On the other hand, seasonal temperature fluctuations in the hinterland are more marked. The Ardennes in the south-east of Belgium are the only mountain range in an otherwise generally flat country. This is where the highest point of Belgium is to be found – the Botrange, 694 metres above sea level. The average annual temperature of 5.7 degrees is significantly lower compared with the rest of Belgium, and the annual precipitation of 1500 litres per square metre is almost twice as high.